A Strange Door is a mysterious door on a floating island in the middle of Niben Bay. 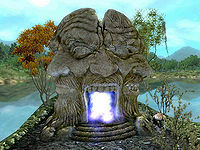 The door only appears after installing the Shivering Isles expansion pack, at which points it serves as the gate through which you enter the Shivering Isles, Sheogorath's realm. Gaius Prentus has been posted to guard the door on orders from the Bravil City Guard and will be the first NPC you encounter. S'fara can also be found here, and will shortly be joined by Belmyne Dreleth. The gateway appears in the Shivering Isles as the Door to Cyrodiil. The island gives you a first taste of the flora populating both the Dementia and Mania portions of the Isles. The following table provides a full list of the ingredients that can be harvested from the plants in proximity. The entrance to the door can get surprisingly crowded in certain situations. Not only are S'fara and Gaius Prentus already standing close it, your horse (if you have one) also has a tendency to "park" itself rather close to the entryway upon arrival. Furthermore, if you have obtained Ushnar's Skinned Hound from a quest in the Shivering Isles and it gets stuck by the door due to a bug, the entryway into the Shivering Isles can get almost comically crowded, up to a point where you'll have difficulty passing through. A (non-floating) island can be found at this location in ESO, although it can only be seen from a distance. Switching between localized game versions may result in NPCs from Shivering Isles emerging into Cyrodiil at this location. This can result in broken quests, as there is no way to force them to return and they can't be spoken to in Cyrodiil. ? Mod Notes: Tested on PS3 by switching from English to German and back.